A novel epoxy resin nanocomposite containing epoxidized novolac (ENR) and epoxidized polystyrene (EPSt) was fabricated through the curing with amine-functionalized multiple-walled carbon nanotubes (MWCNTs–NH2). The chemical structures of the synthesized samples were characterized using Fourier transform infrared and proton nuclear magnetic resonance (1H NMR) spectroscopies. The composition of ENR:EPSt:MWCNTs–NH2 nanocomposite was set as 75:20:5 wt%. 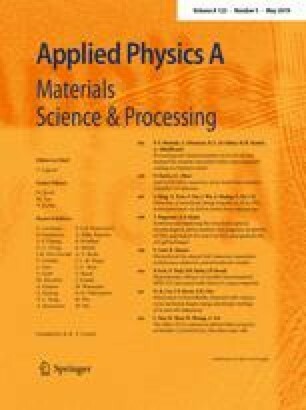 The morphology and thermal stability of the fabricated nanocomposite were investigated using scanning electron microscopy (SEM) and thermogravimetric analysis, respectively. The SEM image revealed that the modified MWCNTs are well dispersed in the ENR–EPSt matrix without any agglomeration. The curing temperatures of the ENR, ENR–EPSt, and ENR–EPSt/MWCNTs nanocomposite were investigated using differential scanning calorimetric analysis. According to thermal property studies results, the addition of PSt as well as curing of mixture using amine-functionalized MWCNTs has synergistic effect on the thermal stability of the ENR resin. The online version of this article ( https://doi.org/10.1007/s00339-019-2599-4) contains supplementary material, which is available to authorized users. The authors gratefully acknowledge the Nano Drug Delivery Research Center, Kermanshah University of Medical Sciences, Kermanshah, Iran; Payame Noor University, Tehran, Iran; and Azarbaijan Shahid Madani University, Tabriz, Iran for partial financial supports.